It's been some journey. 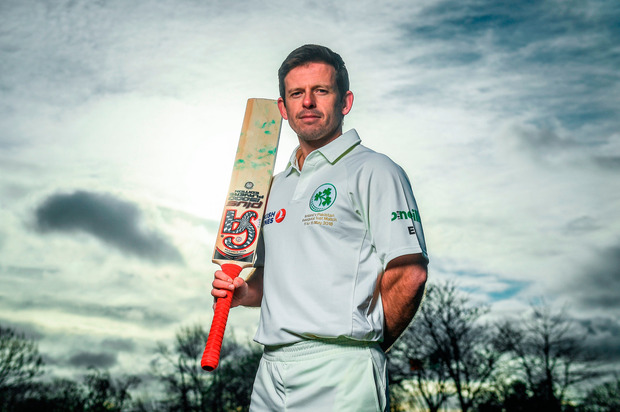 When the teams line up tomorrow morning at Malahide for Ireland's first Test match - yes, Test match - those of us lucky enough to have enjoyed the ride will have a quiet smile as we recall the bumps in the road as well as the triumphs along the way. Perhaps even a grin when remembering the Irish Independent being the first publication to raise the prospect of Ireland playing Test cricket back in 2008 (inset right) and being scoffed at, even mocked, by those who knew it would never happen in their lifetimes. The remarkable distance travelled is best seen in the career of Boyd Rankin who made his Ireland debut against the Free Foresters, at Eton College in 2003, starred in the 2007 World Cup campaign, won a Test cap for England in Sydney and is now set to join a select band who have played at the highest level for two countries. From arranging fixtures against amateurs to a Test match against Pakistan in 15 seasons. For this correspondent the adventure started way before all that in 1994 with a failed World Cup qualification bid in Nairobi quickly followed by the appointment of Mike Hendrick as coach and the excitement of winning the European Championship two years later in Denmark. Hendrick 'built the tracks' that the bandwagon would roll down years later with his organisation of youth cricket and accelerated pathways into the senior team for the likes of Ed Joyce but he narrowly missed out on World Cup qualification to Scotland in 1997. Things sort of bumbled along for a while then, two years after Hendrick left, Ireland were humbled by the USA in a World Cup qualifier and lost all three matches to Wales, an England team of club players and Scotland to be handed the Triple Crown wooden spoon. That was the nadir. While captain Kyle McCallan publicly railed against a broken system, John Wright, the honorary secretary of the then Irish Cricket Union, set about making it work by appointing a little-known but hard-working South African as coach. No matter. With Johnston at the helm on the field and 'Wee John' and Birrell pulling the strings off it, Ireland took the cricket world by storm. Everyone recalls the World Cup victory over Pakistan that Wright celebrated barely a year before his death, but Birrell also beat Kenya to win the InterContinental Cup and his successor Phil Simmons lifted that trophy a further three times. Whatever the future, Simmons will remain the most successful Ireland coach, with 11 titles in eight years. What a team he had, with fearsome competitors Johnston and John Mooney, artists like Joyce, big-hitters Paul Stirling and Kevin O'Brien, and battlers - a whole team of battlers. If there is a tinge of regret this week it's that those players should have been playing Test cricket a decade ago when they were at their peak, not made to wait until the infrastructure of Cricket Ireland was deemed good enough by the International Cricket Council. Surely the game should always take precedence over the business side and if it had titans such as Johnston, Mooney, McCallan, Andy White, Andre Botha, Alex Cusack, Jeremy Bray and David Langford-Smith would all have won Test caps. That those wonderful players will never get to wear green at the highest level is something for Barry McCarthy to ponder as he comes to terms with his surprise omission from the squad. McCarthy's time will come again, others can only look back with pride.